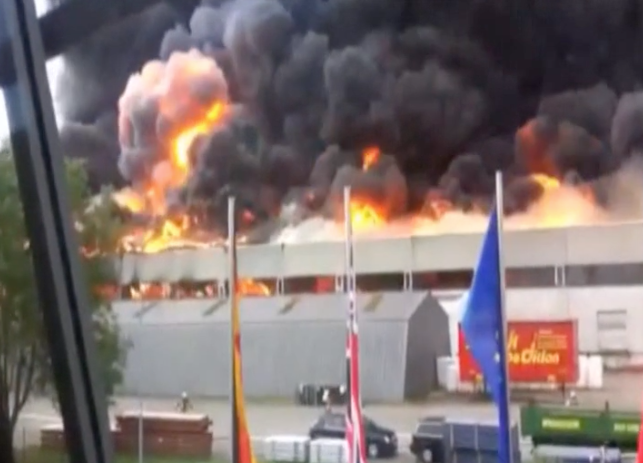 This impressive video was taken by the media covering a huge warehouse fire in Böblingen, Germany. After extensive testing, the entire region of Böblingen had recently converted from foam to F-500 Encapsulator Agent. On June 11, 2014, the Reisser AG bathroom fixtures plant became the largest fire in Boblingen since World War II. Damages exceeded $57 million and required 450 firefighting personnel for several days. F-500 Encapsulator Agent was used to cool a fire wall against the intense heat to prevent the fire from spreading to an adjacent 16,000 ft2 storage area and a four story office building. F-500 EA at 1% held the fire back for over five hours. Loss of the office building could have exceeded 285 million dollars. The limited supply of F-500 EA was successfully used to cool a wall that prevented the spread of the fire to other parts of the warehouse and a four story office complex. F-500 EA has been used on many impressive fires and in some cases was the only agent capable of extinguishment.